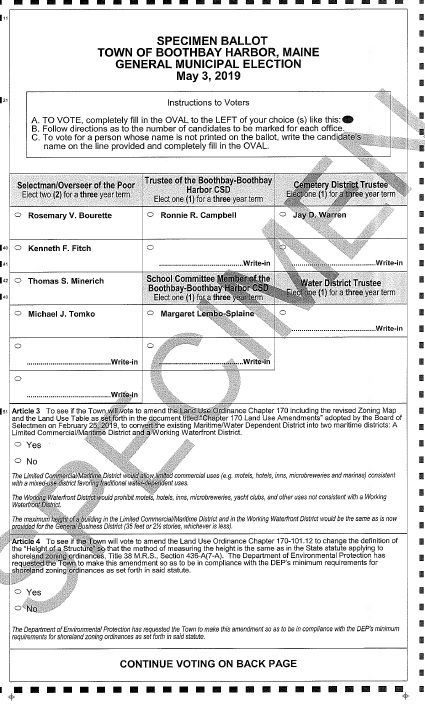 An education session outlined all changes to come if Boothbay voters approve three ballot questions May 3. The session came before a regularly scheduled select board meeting April 8 where Code Enforcement Officer Geoff Smith acted as a guide through the articles. A “yes” vote on Article 3 will split the existing Maritime/Water Dependent District into two separate districts –the Limited Commercial/Maritime District (LC/M) and the Working Waterfront District (WW). Limited commercial uses like motels, hotels and inns would be allowed in the proposed LC/M and would be prohibited for the proposed WW, as would microbreweries, yacht clubs and all other uses inconsistent with working waterfront. Article 3 also changes the maximum height of a building to 35 feet or 2.5 stories. A “yes” vote on Article 4 amends the method of measuring building height in the shoreland zone to match the state’s method – from the downward most slope of a proposed building. During the process of Department of Environmental Protection’s pre-approval of the suggested changes, the DEP found the inconsistency and strongly suggested an update to town codes and mandated the rules be adhered to in practice. A “yes” vote on Article 5 corrects a punctuation error in the definition of functionally water-dependent uses. The correction places parentheses on the phrase “excluding recreational boat storage buildings,” an effort to show the exclusion applies only to this use, and does not change the intended meaning of the phrase. Boothbay Lights’ Michael Maxim shared a summary of the event’s successes over the last season. Maxim revealed business highlights from a Boothbay Lights-administered survey which showed 74 percent of respondents saw an increase in business from year one to year three. The low end of increases were around five percent, but the higher end of increases were around 165 percent and the average was about 32 percent, Maxim said. Maxim said the most important changes moving into 2019 will be transitioning from the use of planning and sponsorship company Green Tree Events to a standalone committee. Boothbay Lights is aiming to have the website updated for 2019's signature events by May, with leftover rack cards to go out by Memorial Day and new rack cards hopefully by the end of June, Maxim said. Selectmen voted unanimously to update public participation guidelines. Chair Wendy Wolf said because the board will have at least one new member after the May 3 elections, clearer guidelines will make it a smoother transition. Hoffman’s wife Sarah Foulger revealed this would be Hoffman's last meeting and she took the opportunity through public forum to thank him for his six years on the board. Hoffman’s seat is up this year and he chose not to run. Town Manager Tom Woodin announced that after six weeks of no reply to advertisements seeking a harbor master, he will be renewing ads for a seventh week. Woodin said there is an interest in the assistant harbor master job when it becomes available in the busier months.